This car is the lowest E46 we’ve seen for quite some time. 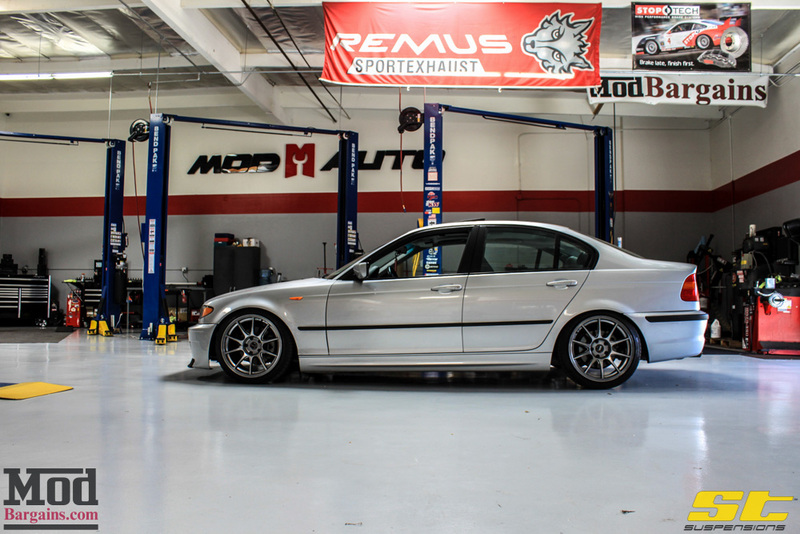 Ceasar S’ E46 BMW 325i rolled up on a set of broken ‘cheap’ noname coilovers, the top hat was barely attached and the shock body had separated from the inner liner… so the ride wasn’t the best – Ceasar hit up the Mod Experts to put the fix on his E46 suspension, and the Mod Experts in turn set him up with ST Suspension Coilovers for E46 and facilitated the install. 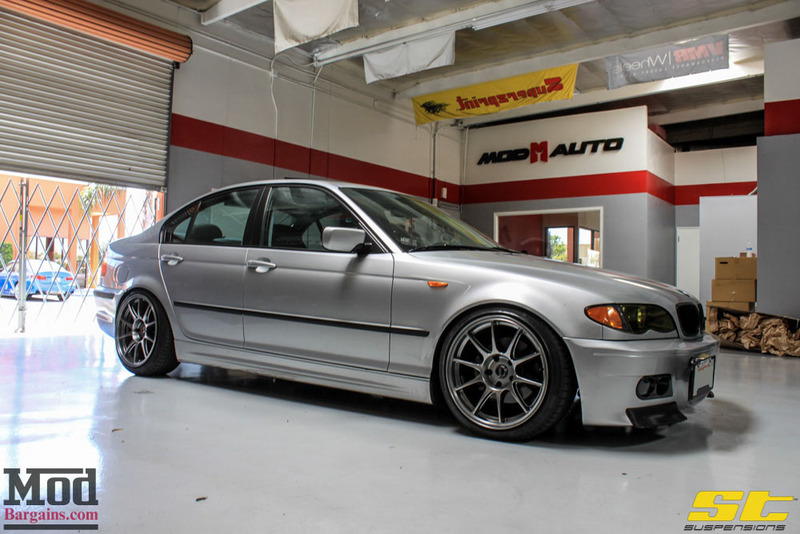 Dave, Sr Tech at Mod Auto, made quick work of removing the busted noname coilovers to get this fitted car low. The coilovers the car came in on weren’t in the best shape, totally caked in the hydraulic oil that’s supposed to be INSIDE the shock body. 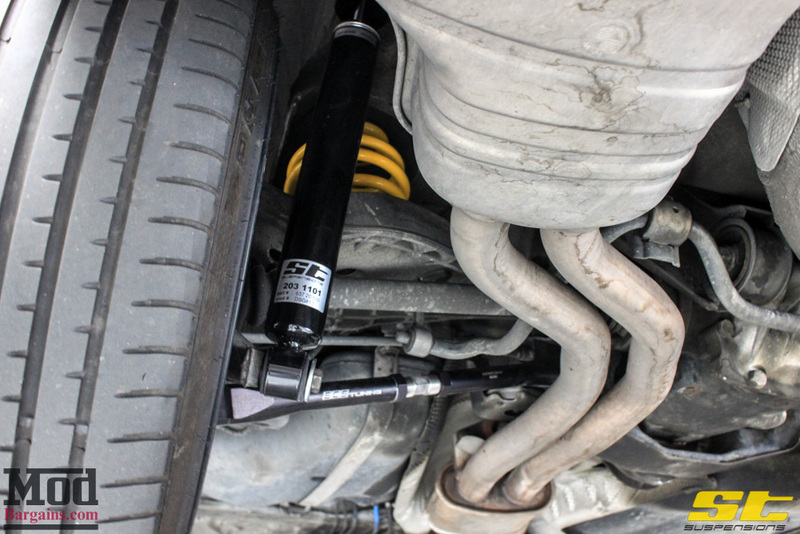 Even though ST’s are considered a “budget” coilover, they’re still great quality and are a huge improvement over the coils they replace. 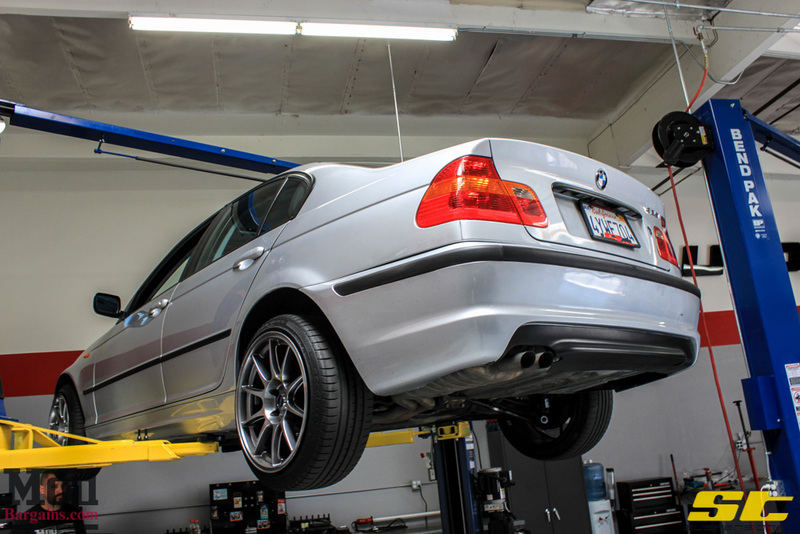 When you lower a car to an extreme, the suspension geometry changes, so a set of adjustable Rear Control Arms from ECS helps correct the suspension geometry to keep the E46 from going full DEMON CAMBER. 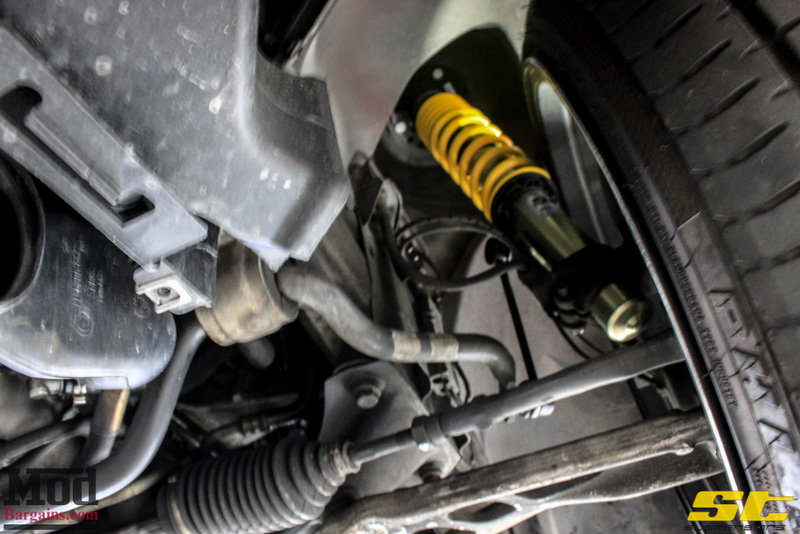 The fitment is pretty aggressive with a lot more stretch than we’d normally advise, but for that ‘style’, it looks good and achieves the look he’s going for. 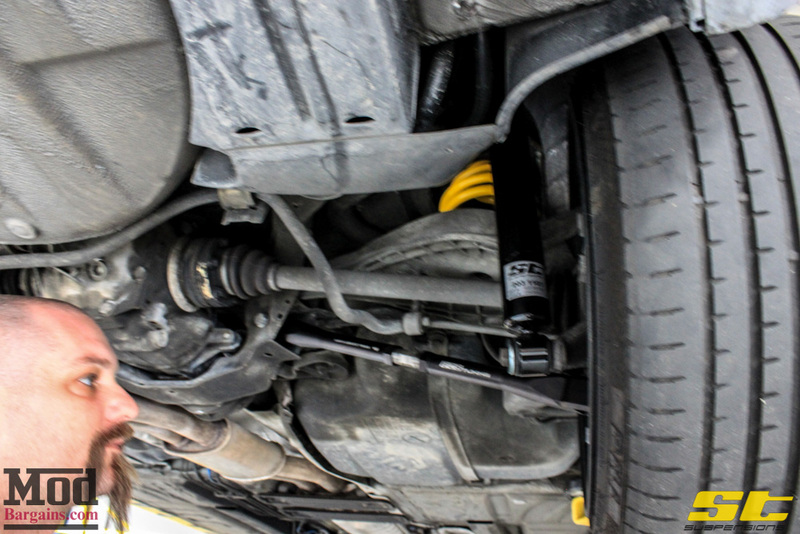 Now we just have to get the car back on the ground and appreciate our handiwork. 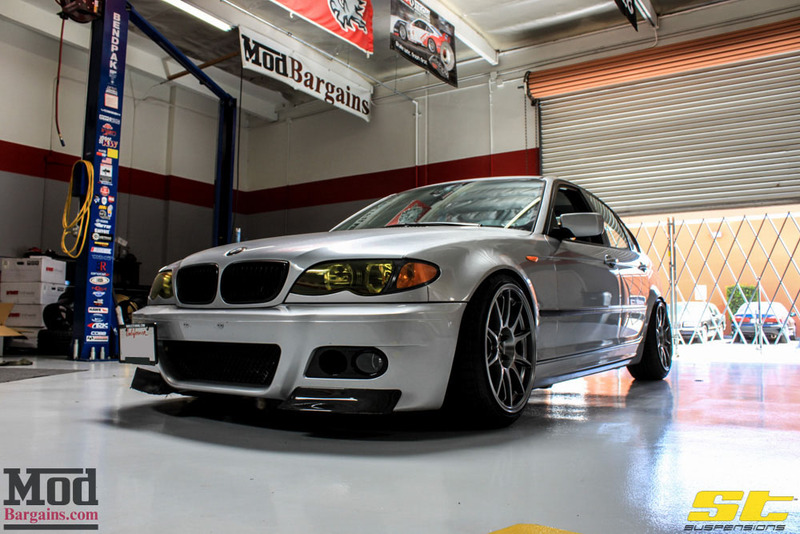 Despite the mostly-stock exterior, this E46 325i has a look all its own. 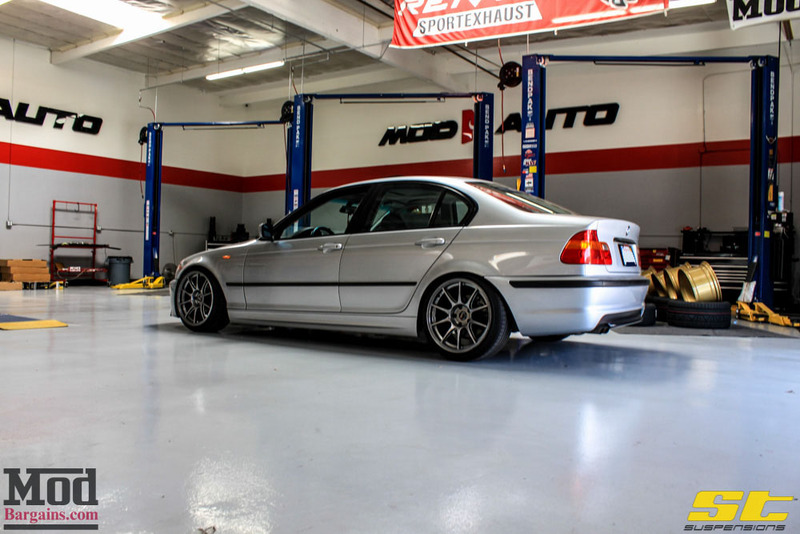 With more stretch than the Saggy Baggy Elephant and stance low enough be a Limbo champion, this E46 is definitely going to break necks wherever it goes. 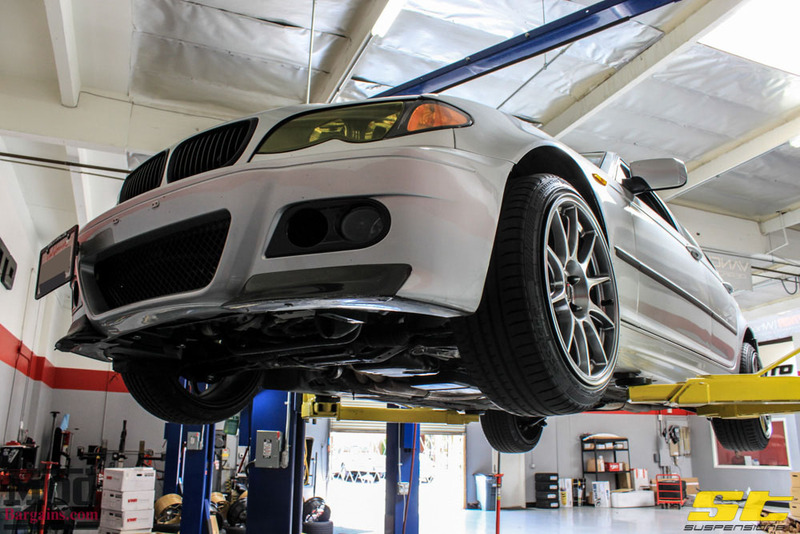 H/T to the Mod Experts for getting this install dialed in, and thanks to Ceasar for choosing to bring his E46 to the Mod Auto shop. 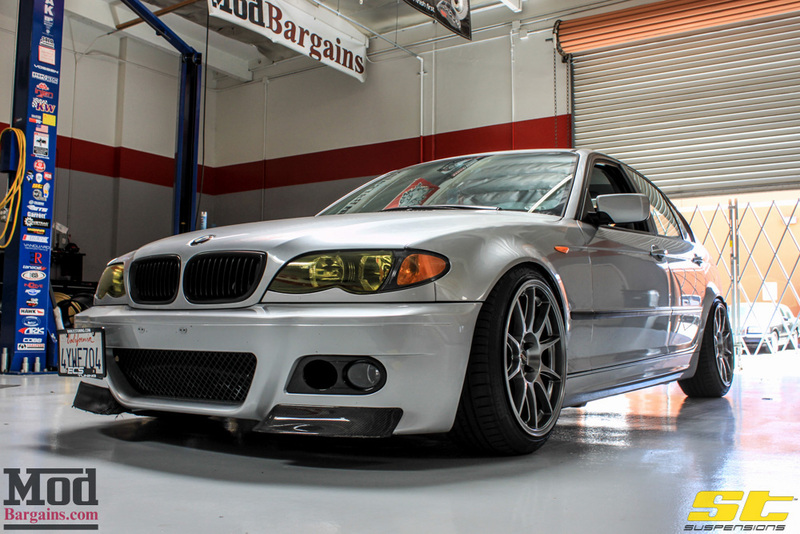 Want to lower your BMW? Whether you’re on a budget or can spend like a baller, we’ve got a number of suspension options ranging from Grassroots Racer budget to DTM Race Car – talk to the Mod Experts – give us a call at 714-582-3330 today, chat live at ModBargains.com or visit our showroom any time between 8-5 Monday-Saturday in La Habra, CA.